Bosch is focusing on electromobility, powertrain efficiency and advanced safety systems to enable the growth of motorcycling as sustainable transport. Whether as a transport option for the emerging mass markets or as an element of multimodal mobility in megacities: two-wheelers are increasingly in demand. By 2021, the annual global production of two-wheelers is forecast to reach around 160 million units – one-third more than today. This makes motorcycle technology a remarkable driver for business. Bosch’s Two-Wheeler & Powersports business unit, based in Yokohama, Japan, continues to gain momentum in the important global motorcycle and powersports market. Bosch offers the motorcycle market a range of products including assistance systems, connectivity products and modern powertrain and electrification systems for two-wheelers and powersport vehicles. One of Bosch’s goals is to make riding accident-free. At the company, two-wheeler safety starts right from the e-bike. With the market’s first production antilock braking system for eBikes, the success-story of Bosch assistance systems for two-wheelers continues. With this system, the braking distance can be shortened and the risk of flipping over the handlebars is reduced. According to a Bosch accident research study, around a quarter of pedelec accidents could be reduced if all bicycles were equipped with the ABS system. 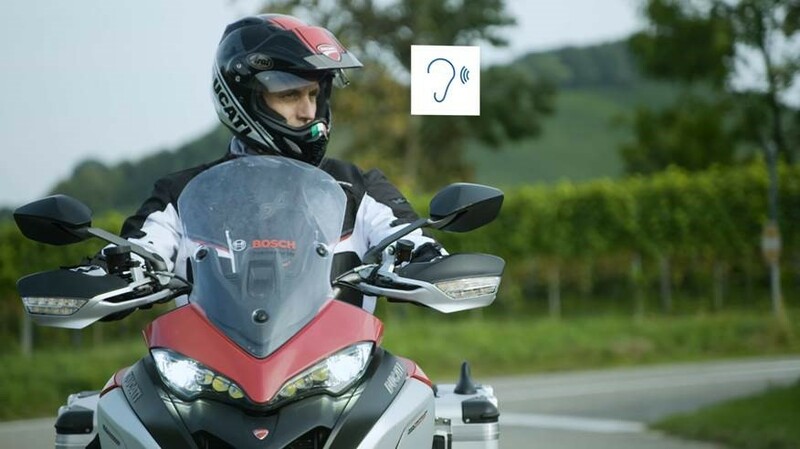 Bosch has made motorcycle assistance systems such as ABS, MSC (motorcycle stability control), and side view assist a firm feature in the market. Yet the possibilities for developing innovative technology for safer riding have by no means been exhausted: “Our vision for the future is to use connectivity to prevent accidents from happening in the first place,” says Dr Dirk Hoheisel, member of the board of management of Robert Bosch GmbH..
“Technology for automated and connected driving are taking the development of cars forward at an incredible pace; if motorcycles are to overcome the challenges related to future mobility, they need to have access to the same technology,“ Hoheisel says. For this reason, Bosch is creating connectivity systems that allow riders to communicate with vehicles, the infrastructure and other road users in general, like the digital protection shield. It allows motorcycles and cars to talk to each other. Long before drivers or their vehicles’ sensors catch sight of a motorcycle, this technology informs them that a motorcycle is approaching, allowing them to adopt a more defensive driving strategy. Another method which allows the rider to be connected and safe is the connected horizon; riders can look around the next bend and get advance warning of possible hazards. By 2025, more than 70 percent of newly registered motorcycles worldwide will be connected. It is not only connectivity that is continuing to pick up pace at Bosch, but also electromobility. In the years ahead, the market for light electric vehicles like eScooters is expected to grow by about 40 percent. Studies indicate that some 100 million such vehicles will be manufactured worldwide by 2020. “Electromobility will take off much more rapidly in small-vehicle segments. Small electric vehicles have a bright future, worldwide,” Hoheisel says. Bosch has developed scalable powertrain systems that enable the electrification of light vehicles on four, three, or two wheels, such as the Govecs eSchwalbe or the AIMA eScooter. The systems comprise a motor, control unit, battery, charger, display (HMI), and connectivity box, as well as an interactive app that connects the rider’s smartphone with the vehicle. Bosch’s electrified powertrain solutions are scalable across all performance classes between 0.25 and 20 kW. Vehicle manufacturers benefit from a comprehensive systems solution that can be quickly integrated, and that also means less development effort. This reduces complexity, variants, and cost – for manufacturers and thus also for anyone who wants to drive electrically through their city. One further advantage: the small vehicles not only reduce emissions, but noise as well. While Bosch is stepping up its efforts related to electrified mobility, it is also continuing to improve the combustion engine with electronic engine management solutions. These allow two-wheelers and powersport vehicles to satisfy the latest emissions regulations, such as Euro 5 and BS 6 (Bharat stage), and can reduce CO2 emissions, while still meeting the demand for the latest functionalities and improved performance. “Megatrends such as urbanisation and sustainability will fundamentally change mobility and the motorcycle as we know it today. Bosch technologies make the motorcycle fit for the future: first by making it safer, second by making its powertrain more efficient,” concludes Hoheisel. Bosch’s vision is to make the mobility of the future accident-free, stress-free and emissions-free – and this goes for motorcycles as well.